The right diet can minimize the risk of heart disease - America's leading cause of death. Cooking for Healthy Heart encourages an understanding of heart disease, and highlights the importance of healthy eating as a preventative measure against this disease. 80 delicious, accessible recipes specifically designed to lower cholesterol are provided with meal ideas packed with fruits, salads, lean meats and oily fish, nuts and low-fat dairy produce. 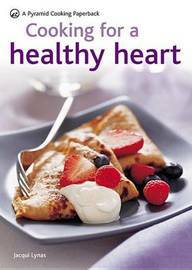 "Cooking for a Healthy Heart" also includes ideas for special occasions, such as celebration meals, meals for one, and quick and healthy snacks. Jacqui Lynas is a state registered dietician with a specialist interest in heart-disease prevention. She works for the Family Heart Association and is an acknowledged expert in her field with over 20 years' experience. She is a regular contributor to medical textbooks, journals and magazines, as well as being a popular speaker at scintific meetings.